"FULL OF LIGHTSABER BATTLES, THE JEDI PHILOSOPHY, AND LOTS OF NEW LIFE-FORMS." "Reaves writes with a creative flair, allowing readers to experience an almost cinematic sensation as they move through the story. The language is colorful, the action scenes are dynamic, and the dialogue is realistic.... Shadow Hunter is a very good "Star Wars" novel that reads as easily as a comic book.... Reaves does an excellent job." " FULL OF LIGHTSABER BATTLES, THE JEDI PHILOSOPHY, AND LOTS OF NEW LIFE-FORMS." " Reaves writes with a creative flair, allowing readers to experience an almost cinematic sensation as they move through the story. The language is colorful, the action scenes are dynamic, and the dialogue is realistic.... Shadow Hunter is a very good "Star Wars" novel that reads as easily as a comic book.... Reaves does an excellent job." With the Jedi all but wiped out in the grim aftermath of Order 66, the Empire’s power seems unchecked. But one lone Knight continues to fight the good fight–against all odds and when all else fails. 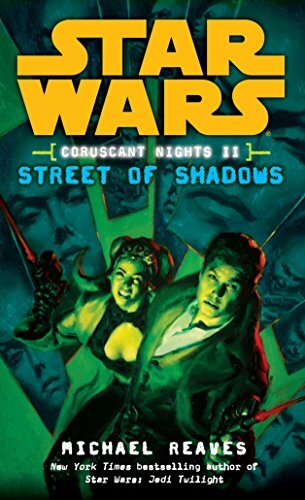 Deep in the bowels of Coruscant, Jedi Jax Pavan ekes out a living as a private investigator, a go-to, can-do guy for the downtrodden. Now a mysterious Zeltron knockout named Deejah approaches Jax with a case that needs to be cracked: to find out who killed her artist lover Volette, brutally murdered hours after his triumphant unveiling of a dazzling new light sculpture with obvious links to lightsaber pyrotechnics. Finding Volette’s killer won’t be easy–too many secrets, too many suspects, and all kinds of motives. But with the droid I-5YQ’s help, and ex-reporter Den Dhur’s excellent snooping skills, the investigation is soon operating like a well-oiled machine. Unfortunately, there’s a far more efficient machine hunting Jax. It’s a deadly game of cat-and-mouse as the clock starts ticking toward the final explosive showdown . . . to see who strikes first and who will die first.